Whenever you want to complain about carbon emissions or global warming or loss of wildlife habitat, there's a one-stop-shop. It's the interminable progress of oil palm plantations in the Far East. We pay for them, as 30% of the cosmetic and food processing oils we use are from these very plantations. There's an easy solution, but maybe the argument is difficult to follow! Product-Oil-Animals Extinct. It's easy really. Now Yale and Stanford Universities are bullying the oil palm too, with two hard-hitting papers designed to clarify just how much carbon is lost to the forest and burned up by this gigantic jungle grab. This second of the two papers that Lisa M. Curran et al have produced was published in the journal Nature Climate Change. Their district-level study was published in the Proceedings of the National Academy of Sciences and emphasised that sustainably producing palm oil will not be a believable objective within Indonesia if present leases are allowed to be taken up. Borneo is the large island that along with Sumatra supplies most of the palm oil to factories. Indonesia has expanded these plantations, especially during 2000 to 2010, and is now exploiting parts of Papua and elsewhere. In Kalimantan, on Borneo, 32% of the provinces' lowland is earmarked for oil palm. That is an area the size of Greece. Such a land-bank means that the 140 million metric tons of carbon emitted in 2010 will be doubled and trebled quite easily, this from the country that already stands out as one of the world's top greenhouse gas producers. Indonesia has pledged 26% reduction in emissions, but if these plantations continue expanding, this pledge seems completely unsustainable. The degraded peat-lands in Indonesia and the loss of such carbon-rich forest (60% of Kalimantan' total forest cover) too means government is either implicit in the development or totally out-of-control. "Despite contentious debate over the types and uses of lands slated for oil palm plantations, the sector has grown rapidly over the past 20 years," said Professor Lisa M. Curran. Above: Malaysian Federated States of Sarawak and Sabah (M) and Brunei (B) are coloured dark grey. Mineral soils are distributed among elevation classes <300 m a.s.l. and >300 m a.s.l. ; >99% of peat soils are <300 m a.s.l. 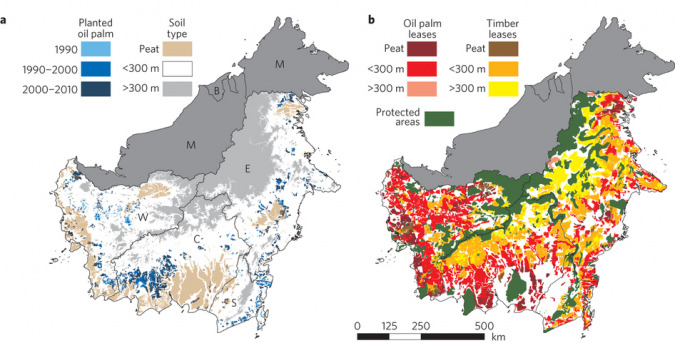 a, From 1990 to 2010, oil palm expanded from 903 km2 to 31,640 km2, occupying 9% of lowlands (<300 m a.s.l) outside of protected areas, distributed among West (W; 28%), Central (C; 40%), South (S; 8%) and East (E; 23%) Kalimantan provinces. b, In 2010, 64% of Kalimantan's lowland area was allocated as follows: planted oil palm and awarded plantation leases (30%); logging concessions and pulp and paper plantations (Timber Leases, 24%); protected areas (10%). Residual lands, depicted in white, comprise only 31% of Kalimantan's total land area. Above is the diagram produced by the study, showing Kalimantan provinces within Borneo in colour. Mineral soils are used to grow almost all of the oil palm, but some peat soil will soon be used too. Professor Curran believes the 79% of oil-palm leases still undeveloped will soon contribute to a massive increase in CO2 release, both from peat rotting and forest burning. Land cover estimates of just how much land is involved and exactly where, are shown in the map above. We really have to worry it seems when such wild places are left to these developers. They have already shown a sure lack of ecological expertise to say the least.